When a member of the military passes away, whether during their time of service or later, it is important to keep their memory alive. There are many opportunities to honor them and their dedication to their country. Let’s explore a few together and celebrate the lives of those who served. 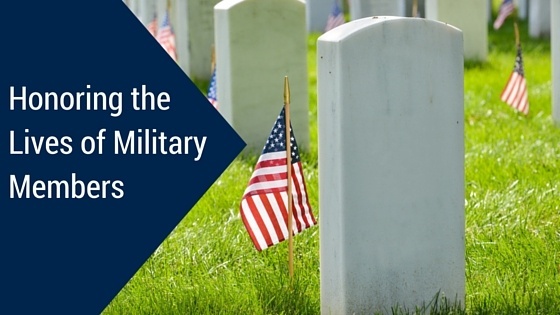 The United States sets aside two holidays to celebrate the lives of military members. Memorial Day, celebrated on the last Monday of May, specifically honors those who lost their lives in combat. Veterans Day, observed every November 11, is a day honoring all military veterans. Both holidays are a chance to bring family and friends together to remember those who have been lost. This can be done as a cookout or picnic, but there should also be plenty of community events in your area. For runners and walkers, these dates are popular for fun runs and 5K or 10K marathons. Many cemeteries host moving memorial services on Memorial Day and Veteran Day. Other popular activities include parades, musical concerts, dances, and sporting events. For instance, Texas Tech in Lubbock, Texas, honors veterans each year at a November football game. A simple way to honor and support veterans is to purchase and wear a Buddy Poppy. These artificial flowers are made by veterans and distributed by the nonprofit organization Veterans of Foreign Wars nonprofit organization. These red and green ornaments have been a symbol of solidarity with veterans since 1922. They are often available at veterans’ events, or you can contact your local VFW post for more information. There are many memorials honoring servicemen and women, including the famous Vietnam Memorial and the World War II memorial. Many Americans are familiar with Arlington National Cemetery, dedicated to those who served in the armed forces since its founding in 1864. But did you know there are 134 national cemeteries? Many states also maintain cemeteries for veterans. These often host their own Memorial Day and Veterans Day services, but they are beautiful destinations to visit year round. To find your nearest veterans’ cemetery, you can use this handy web page from the U.S. Department of Veterans Affairs. One of the strongest ways to remember those we’ve lost is to honor those still with us. There are numerous ways to volunteer for the veterans living in your community, at all levels of involvement. There are many veterans in need of someone to visit them, and veterans’ hospitals have many opportunities to serve those who served this country. One of the many interesting ways to help is the Volunteer Transportation Network. Volunteers provide transportation for veterans, either in the volunteer’s vehicle or a government-owned vehicle. There are also Welcome Home events because every veteran deserves to be greeted with thanks when they return to the United States. You can also sign up to run errands, help with housework, or provide companionship. Contacting your local veterans service organization will help connect you with ways to donate money or time. At the U.S. Department of Veterans Affairs, you can fill out a request for more information online, or contact your local veterans’ hospital. The Disabled American Veterans is another great resource for volunteering locally. Taking the time to remember and appreciate men and women in the armed services is important. Whether you’re attending a parade or volunteering in a veterans’ hospital, you are honoring those we have lost. If you’re in need of a military funeral in the Lubbock, Texas, area, please contact us at Lake Ridge Chapel. We are fully equipped to meet the special needs of a memorial service for a veteran.